This Certificate Program is designed on case-to-case basis, for individual clinicians and small groups. Curriculum of this program includes the mentorship supervision, and also exposure to the work of advanced clinicians utilizing the object relations approach. Candidates of this program will benefit from experiential learning of how to process “objective countertransference,” and of concepts of the “transitional space” & “transitional object,” “holding environment,” “psychic container,” and “projective identification.” In some cases, the candidate will be encouraged to register for some object relations clinical theory courses, as per discretion of the mentor/ supervisor. Who is an “interpreting subject” who can receive symbolic interpretations in treatment, and who isn’t? How to negotiate the "interpreting and holding" (Seinfeld)? Who is an “historical subject” (Klein, Ogden) who can experience the psychic reality of time and responsibility for the limits and progression of their lives, and who endlessly repeats the delusion of “starting all over again”? How is a symbolic level of understanding and self-reflective capacity achieved (which sometimes called “mentalization”) and when is it not? What is the loyalty to bad objects, the moral defense (Fairbairn), and the "attacks on linking" (Bion)? 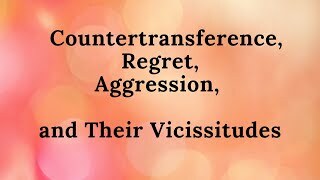 How the psychoanalytic learning can be processed through the lens of “objective countertransference” feelings, associations, and visceral experiences. To register, please send the APPLICATION form and the registration fee to: ORI Administrator, 75-15 187 street, Fresh Meadows, NY, 11366-1725. After application is received, potential candidate(s) will be given a list of available clinical mentors approved by the Training Committee of ORI. For more information, email Admin@ORINYC.org or DrKavalerAdler@gmail.com, OR call 212-674-5425 or 646-522-0387 / 646-522-1056. Website created by MindMendMedia (last updated on 03/04/2016).